Romans 8:35 and 37Can anything ever separate us from Christ’s love? Does it mean he no longer loves us if we have trouble or calamity, or are persecuted, or hungry, or destitute, or in danger, or threatened with death? 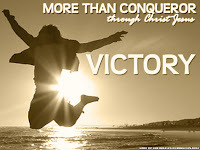 No, despite all these things, overwhelming victory is ours through Christ, who loved us." Often in our lives we face some challenges. There are many things that ambush us without warning. Bad things happen to good people: divorce, bankruptcy, automobile accidents, loss of job, heart attacks and other health issues...the list goes on and on. You cannot plan an ambush attack. But you and I can prepare for them. It's not these attacks that determine our outcome but rather our response to them. The most important gift you could get this Christmas is mas Christ...more of Christ! To have a personal relationship with the Lord. Once you have encountered His love, no thing can separate you from from it. No trouble or calamity, no painful trial, no accident or ambush attack. In fact, every time that you face these attacks you become stronger and you become "more than a conqueror". Overwhelming victory IN every situation is inevitable. Trust the Lord and believe that every thing has a purpose and a meaning. Learn from the pain. Like the Marines say, "pain is weakness leaving the body." Boy, I have alot of weakness exiting my life right now! God loves you and victory is yours today! 38 "And I am convinced that nothing can ever separate us from God’s love".